We are continuing the really long drum roll of our Grand Opening Celebration with another community event in Fairfax! Join us for Pliés in the Park! 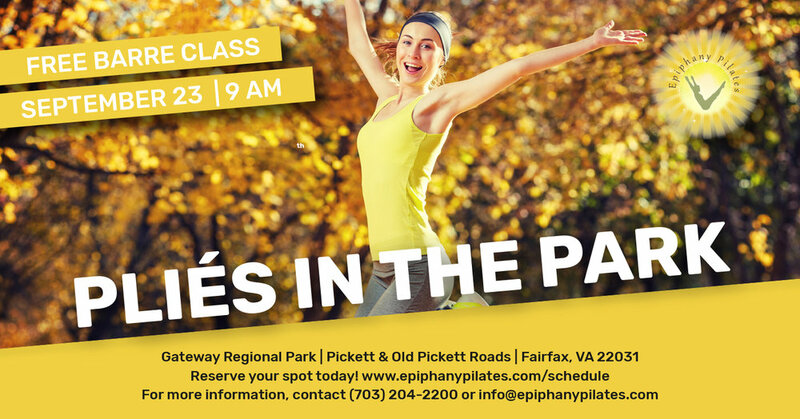 This FREE 45-minute express barre class will be held Saturday, September 23rd at 9:00am at Gateway Regional Park, which is located at the intersection of Pickett & Old Pickett Roads in Fairfax, VA 22031. This upbeat, fast-paced class will incorporate the use of light hand weights to tone the arm and back muscles as well as high-energy cardio intervals to maximize the burn. All fitness levels are welcome! Reserve your spot today, www.epiphanypilates.com/schedule. For more information contact (703) 204-2200 or info@epiphanypilates.com.